Looking for family-friendly activities to fill the weekend before Halloween? Philly has a lot to offer from Friday, Oct. 27, through Sunday, Oct. 29. There are festivals, trick-or-treating opportunities, museum deals, costume parades and more ways to keep everyone entertained as they count down to Oct. 31. See a circus performance at the annual PumpkinFest celebration. 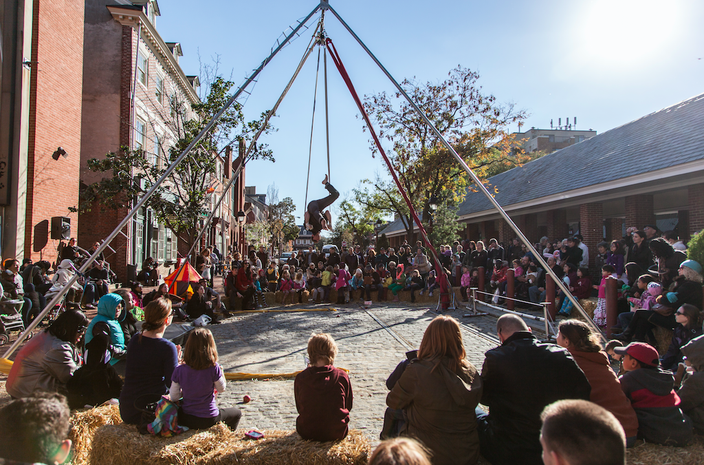 On Saturday, Oct. 28, PumpkinFest will take place at Headhouse Square. Festival highlights include mini-golf, a pumpkin pie eating contest, costume contests, free neighborhood trick-or-treating at dozens of businesses (3-5 p.m.), aerial performances from the Philadelphia School of Circus Arts, pumpkin decorating, hay rides, a hay bale maze and a magic show. The day before, on Oct. 27, there will also be free Halloween-themed outdoor movie screenings at the Headhouse Shambles. At 6 p.m., "It's the Great Pumpkin, Charlie Brown" will be screened, followed by "Young Frankenstein" at 7 p.m. and then "Night of the Living Dead" at 9 p.m.
Laurel Hill Cemetery will host its annual family-friendly Halloween celebration on Sunday, Oct. 29. Families can pack a picnic, dress in costume and enjoy a fall day on the grounds. Activities will include a pumpkin patch, readings from the Storybook Fairy, hula-hooping with The Philadelphia Spin Coalition and – new this year — hay rides throughout the grounds. The event is recommended for children ages 4-12. Admission is $5 per person. 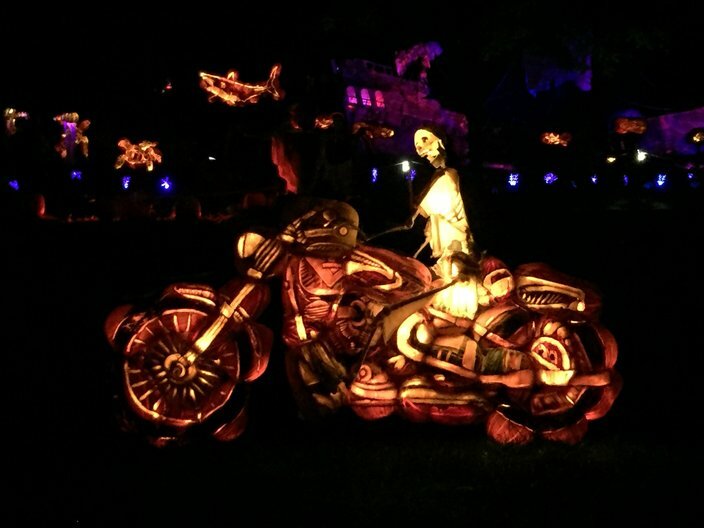 "The Glow: A Jack O'Lantern Experience"
A motorcycle made from jack-o'-lanterns at The Glow. Check out 5,000 hand-carved jack-o'-lanterns this fall in West Fairmount Park. "The Glow," located near the Mann Center, features huge pumpkin sculptures and detailed carvings. Dinosaurs, sea creatures, a carnival, a biker gang and more have been created from jack-o'-lanterns. Individual pumpkins carved with images of celebrities and Disney characters create a "wow" factor, too. Kids can trick or treat through Peddler's Village, stopping at the various shops and businesses for treats, on Friday, Oct. 27. While there, check out the scarecrows on display. Kids can dress in costume to go on a trick-or-treat safari through the Philadelphia Zoo on Saturday, Oct. 28, and Sunday, Oct. 29. When not checking out the animals, little trick-or-treaters can learn about extinction, run through a hay bale maze and pose for pictures in front of the giant pumpkin wall. The event is included with general admission. Children under age 2 can attend for free. 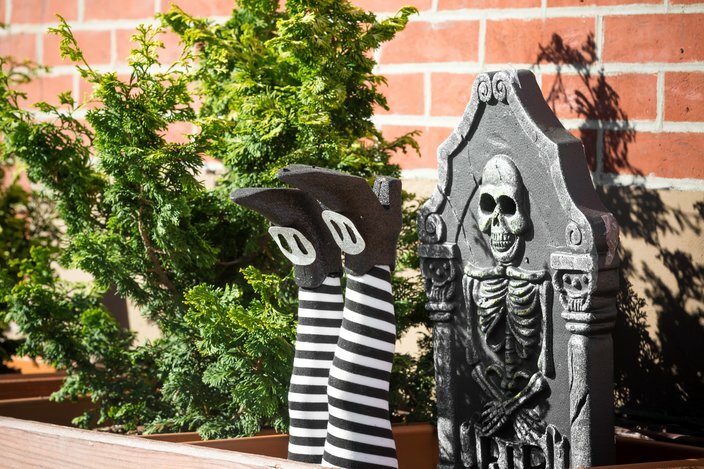 Play a round of spooky mini-golf at Franklin Square over the weekend. The 18 holes, which feature historic Philadelphia landmarks like Independence Hall and the Philadelphia Museum of Art, will have Halloween-inspired lights, music and surprises. The Please Touch Museum will throw an all-day party on Saturday, Oct. 28. Kids are invited to dress in costume and spend the day playing. They can make goodie bags, go on a scavenger hunt, do arts & crafts, play with pumpkins and join a "spook-tacular" dance party. This family-friendly festival in East Passyunk has a little something for everyone. Kids can enjoy a free pumpkin decorating station, can go on a scarecrow scavenger hunt, can trick or treat and can enter a costume contest. Parents can shop the craft show, which will feature artwork, clothing, jewelry and other knickknacks, or can enjoy food & drink outside from Stogie Joe's and Mamma Maria Ristorante. Even the family dog gets something out of this festival. Dog treats and water will be available at Amelie's Bark Shop. Halloween decorations in a Philly neighborhood. Families can dress in costume and go trick-or-treating along Rittenhouse Row. Adolf Biecker, Barbour, Beans Beauty, Born Yesterday, Capital One, Continental Midtown, The Dandelion, DFTI Boutique, DiBruno Bros., El Rey, Innervision Eyewear, Joan Shepp, Melograno, Saxbys, Shop Sixty Five, Sonesta Hotel, South Moon Under, Square 1682, The Bellevue, The Children’s Boutique, The Shade Store, Urban Zen and many more businesses will be participating. Just look for the cat sign indicating trick-or-treat locations in windows around Rittenhouse Row. On Saturday, Oct. 28, through Sunday, Oct. 29, kids are encouraged to dress as their favorite Revolutionary (open to a wide range of interpretation) and get $2 off admission to the Museum of the American Revolution. Kids of all ages are welcome to take a piece of candy and show off their ensemble in costume parades between 11 a.m. and 3 p.m. on both days. Why did early Americans carve turnips instead of pumpkins? Which spooky stories haunted their nightmares? Why did they stop buying sugar before the war broke out? Those are some of the questions the educator will answer. Explore the spooky world of yokai — Japanese ghosts, monsters and mythical creatures — at Shofuso Japanese House and Garden. During this weekend, families can participate in activities inspired by Japan’s ghost stories while enjoying the grounds. Take part in a scavenger hunt, play carnival games, do arts & crafts and experience Japan’s classic paper theatre style of storytelling.